Going to New York Comic Con? 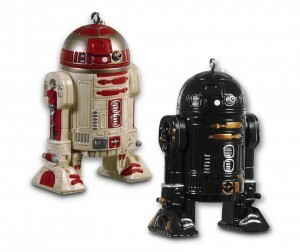 Then you will be able to purchase the Hallmark two-pack collectible R2-Q5 and R2-A3 ornaments, available only at the convention. This is a limited run of 800, so don’t delay if you really want one of these little guys hanging on your Christmas tree. Early visitors to the booth will also receive collectible buttons — a limited number will be given away each day. Check out the Hallmark Booth 110 at the Star Wars Pavilion. Read more about the R2 astromech droids after the jump.R2-Q5 was assigned to the second Death Star in Return of the Jedi, and can be spawned via cheat code in Star Wars: Jedi Knight II: Jedi Outcast and can be unlocked for purchase in LEGO Star Wars: The Complete Saga. R2-A3 served with Wedge Antilles, famous pilot and friend of Luke Skywalker.